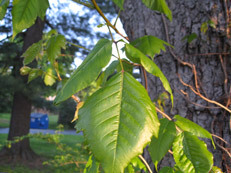 After leaf drop in fall until bud break in spring, look for tiny hands-in-prayer-like buds. 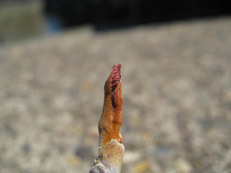 Buds open and unfurl ‘leaves of three that look like me’. 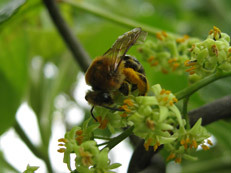 Honey bee collecting pollen from blooming male poison ivy flowers. 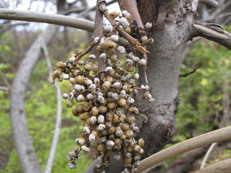 A stalk of ripe poison ivy berries produced by a female plant and ready for consumption by hungry birds.